The fifth edition of the PokerNews Cup officially kicked off on Friday, Oct. 11, at the Montesino Casino in Vienna, Austria. Day 1a of the €250 Main Event attracted 167 players to the tables, showing once again that Europe's low buy-in tournament scene is still healthy and vibrant. The first of the two starting flights also saw 20 players getting the most out of the reentry format and compensate an early elimination with a second shot at the title. The total €42,075 prize pool generated by the entrants of the Main Event's first flight shows great promise for Day 1b, and the organizers believe that the initial €75,000 guarantee will be shattered already after today's first levels of play. During Day 1a, players battled through 12 levels. At the end of play, only 51 of them managed to keep the dream alive and advance to Day 2. Austria's Christian Einstein went to sleep sitting on top of the chip counts with a stack of 265,500 in chips. He was followed by Maximilian Noll (189,000) and Vincent Gomez (153,000) — both well above the day's 91,666 average. As for the six players that qualified through our exclusive PokerNews satellites — Bulgaria's Pavlolv Desislav (95,500), Yotev Yassen (89,000), Alexandru Enoiu (87,000), Milev Krastyn (44,500), Slovakia's Peter Janotka (63,000), and Slovenia's Klemen Kramljak (42,000) — they've all made it to Day 2. Among the notables that were in the field was Thomas Kremser, but unfortunately for him, he was sent home as an early bust out. The 2014 PokerNews Cup Vienna Main Event will be back in action on Saturday for the Day 1b, which will be played simultaneously at the Montesino Casino from 5 p.m. and at the Concord Simmering from 7 p.m., local time. Players will once again sit at the tables to earn a spot at Sunday's final day and put their hands on a share of the €75,000 guaranteed prize pool. As was the case for Day 1a, you can follow the Main Event action live on our Live Reporting section with German commentary. The live stream will then be available with English commentary during the final day on Sunday, Oct. 12. All the players at Montesino Casino who will not be busy with the Main Event, have the chance to join a €75 buy-in second chance event starting at 7 p.m. 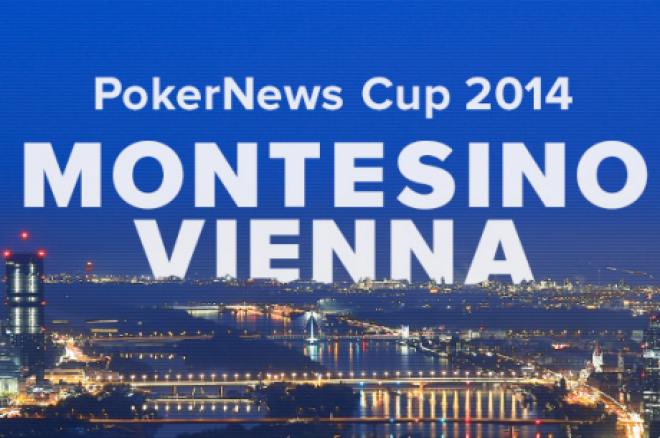 The 2014 PokerNews Cup is Underway!